This event is programmed by the Centre for Mobilities Research at Lancaster University, and is part of Lancaster Arts's #2016OPEN season. This two day workshop with Owen Chapman from Mobile Media Lab, Montreal, will use mobile sound technology to explore the complexities of situated nostalgia. 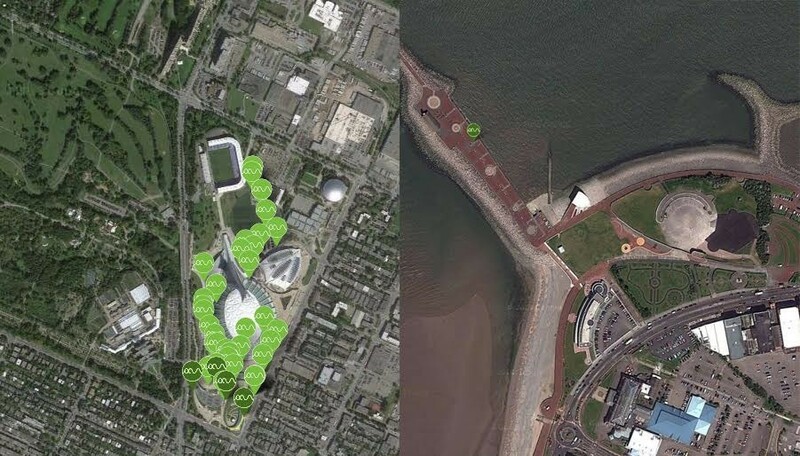 Participants will collaborate in the production of a sonic representation of Morecambe, UK, including an online soundmap that reflects the town's past, present and future. This will be contrasted with a soundmap and other interactive media produced from present-day recordings of the 1976 Olympic Stadium in Montreal. Participants will be introduced to technologies of audio field recording, soundmapping and remixing, including the custom iOS soundmapping app AudioMobile and locative audio remixing application Echoscape. Please see the schedule below for times this event is open to the public. Owen Chapman is co-director of the Montreal wing of the Mobile Media Lab, located in the Communication Studies department at Concordia University, where he is also an Associate Professor in Sound Production and Scholarship. His written works have appeared in The Canadian Journal of Communication, Esse, M/C Journal, Public, and Organised Sound. His audio work involves both live and studio-based creation and has been featured internationally in video soundtracks, contemporary dance projects, solo performances and site-specific installations. Current projects include ‘AudioMobile’ – an iOS app that allows users to record the sounds around them, attaching a photograph and GPS coordinates to the file. Linked to this project is ‘Echoscape’ – a digital arena for the exploration, sampling and remixing of sounds collected with AudioMobile. Lastly, the ‘Audio Toybox’ project involves designing and building customizable communication therapy toys for children with global developmental delay using RFID (Radio Frequency IDentification) technology. The Peter Scott Gallery will be open to the public from 2.30pm, with members of the public welcome to join in the informal discussion towards the end of the session. Production of a sonic representation of Morecambe (Meet under canopy outside the Winter Gardens). *Participants must have attended the introduction on 29th April. In order to offset expenses while keeping the workshop open and equitable, we encourage participants to contribute a £30 registration fee for April 29th; if this fee is not affordable participants are welcomed to register free of charge. Registration is via Eventbrite, payments will be made through Lancaster University online payment system - a reminder will be emailed when this service is available. Tickets: Click here to register at Event Brite.